Sweet chestnut coppice is cut in rotation much like Hazel. In this case the stools are around 22yrs in age, a good time to cut for solid, cleft fencing material and posts. The stems vary in size to some extent but typically are 14"diameter at the base, 30-40ft in height with perhaps 3-6 poles on each 'stool'. The trees are felled in Winter, when the sap is down, and processed by hand splitting using wedges and maul or froe and break to produce cleft halves and quarters or eighths etc. The wood is processed in the woods primarily, the scraps being charcoaled and the excess lumpwood being processed to make excellent stovelogs. Sweet chestnut is thought to have been brought over to the British Isles in Roman times as it has been used for thousands of years as a superb, long lasting construction timber, partly due to how well it splits neatly, and even as a source of food to the romans (a form of polenta can be made by grinding the nuts). It is predominant in this country in the South Eastern counties, namely Kent and Sussex, from where much of the traditional post and rail comes nowadays. It is a very durable timber, being naturally resistant to rot, hence it makes an excellent natural choice for fencing and roofing shingles or outdoor structures, lasting as long as 20+ yrs untreated when winter cut with bark removed. Most sizes of poles are possible and the timber works fantastically well green to produce all sorts of great outdoor products. It is fantastically diverse in its uses, fencing, gates, arches, rose trellis, rose arbours, pergolas, hedging stakes, plant supports, structural creations, buildings (A-frame cruk frames), roof shingles/shakes, tent pegs, river spiles... the list goes on. Looking up a ride in spring in a sweet chestnut coppice. A Ride is a name given to a pathway between designated areas of coppice, for access. Presumably it relates to horse access where the track is clear enough for riding a horse and would be used by passing riders and horse and cart alike. Often in more recent years these tracks are used by forestry vehicles but old maps still show the criss-cross of forest trackways and rides which divide up the coupes of ancient copse. The same woodland as on the left, but 7 yrs after cutting, has been through a cycle of change, now back to the bluebells and 7yr old chestnut stems as opposed to the 24yr old in the left picture. 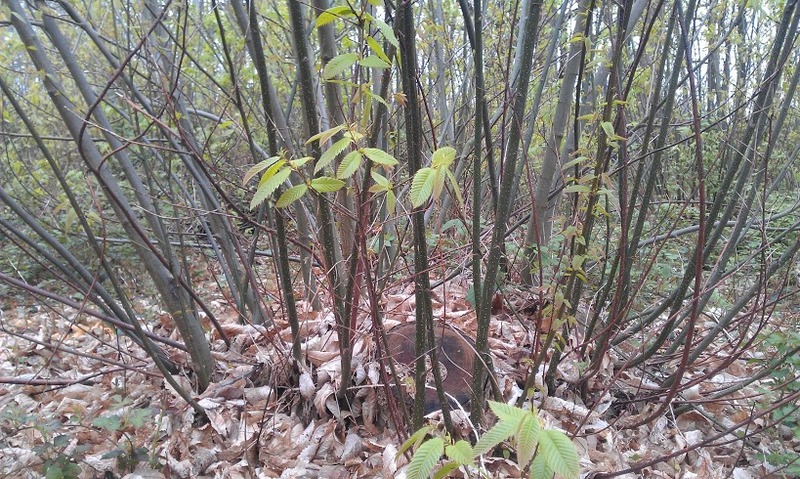 After cutting, the sweet chestnut stool sends out lots of new shoots, growing vigorously. Stool (or mock) is the name given to the cut base of the tree. 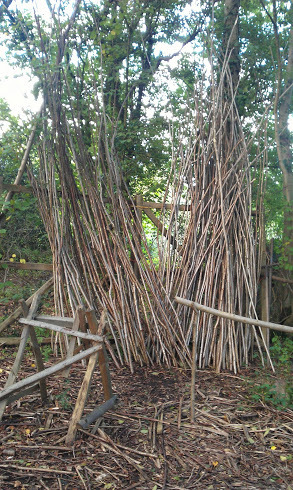 Hazel coppice is usually cut on a 6-7yr rotation to provide slender, flexible rods up to 20+ft long. The rods are processed into a variety of product, dependant on requirement, from hedging stakes and binders through to hurdle rods or garden products such as beanpoles and peasticks. 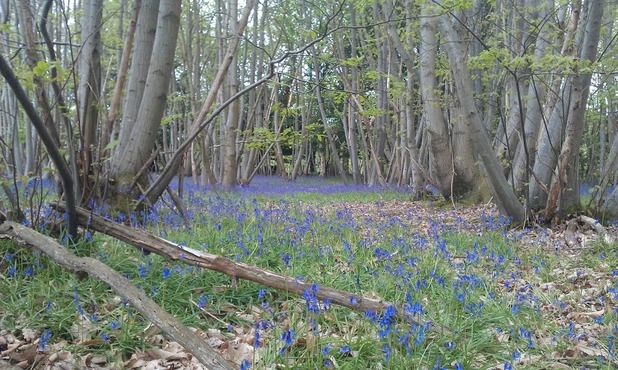 Overstood hazel coppice (coppice which has been neglected for a while) is unfortunately common in Hampshire and ideally should be brought back into useful rotation. 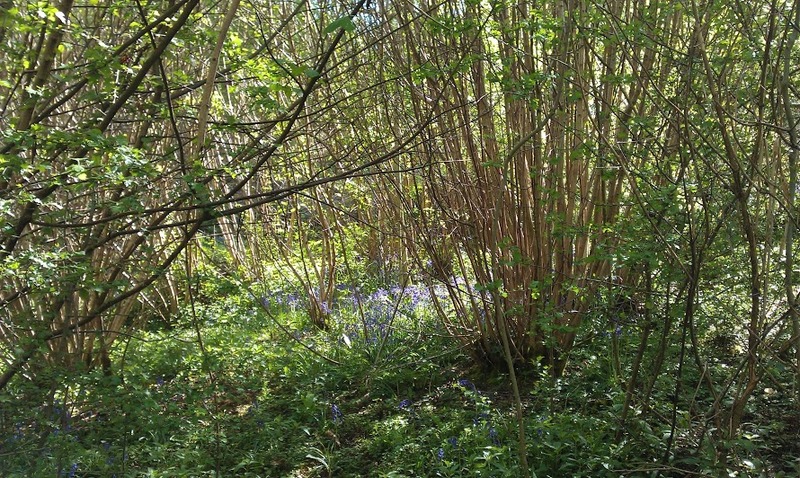 Unmanaged hazel coppice is not a particularly good habitat and is arguably unnatural anyway, by restoring it and providing a diverse range of cut, growing and uncut environments, wildlife flourishes. Birds, insects, plants and dormice all benefit from rotation cut coppice and hazel is no exception. The overstood wood is really only useful as firewood, generally, and the occasional pole initially, so some investment is often needed to get overstood coppice working again, but after the second cut (and providing steps have been taken to minimise deer browsing) the shoots can begin to grow straight and copiously again and with some extra planting the coppice can be restored. Hazel is possibly most noted for its use as a woven material, producing woven fencing, hazel hurdles and also as 'spars' for thatching, where 28"-31" sharpened quarters, split from a 'gad' are bent and twisted in half to create a sort of staple which is used to hold thatch in place. Hazel typically last 5-7yrs outside untreated, depending on exposure, so whilst it is a beautiful material for outdoor woven fences and hurdles, you should be aware that it is not as durable as other rustic borders and fences, eg those made of riven chestnut or oak etc, BUT it is traditional and from a time when 5-7 yrs was seen as along time and replacing old woven fences was par for the course, nothing beats the look of a freshly woven wattle hazel fence or hurdle.